Fresh fruit comes together into a great margarita. Omit the tequila and enjoy a smoothie instead! 1. Puree blueberries in blender or food processor. 2. Add lime juice, 1 tsp. lime zest, ice cubes, tequila and agave nectar. 3. Blend until no ice chunks remain. 4. Put pitcher in freezer for about 15 minutes or until it starts to get slushy. 5. While it is chilling, rim glasses with sea salt mixed with the remaining lime zest. 6. Remove pitcher from freezer and give it another whirl to remix. 7. 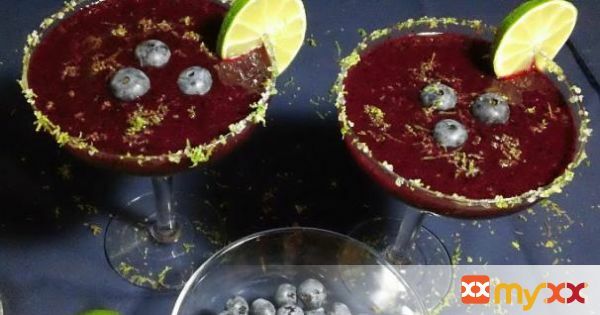 Pour into margartia glasses and garnish with blueberries and a slice of lime. Enjoy! 8. *You could probably substitute frozen blueberries here, but it's blueberry season! 9. Note: Omit the tequila for a great smoothie!